I think I speak for all Texans in wishing Ted and Mollie the best and know that they will be successful in whatever direction life leads them. Photo by Mark Hiebert. Mollie B and Ted Lange will waltz across Texas one last time as the band SqueezeBox Jan. 15-18. They start with a dance in Hallettsville on Jan. 15, then visit the snowbirds at the Mission Bell RV Resort in South Texas on the 16th. They head north to Granger on the 17th, then end their tour in Houston on the 18th. The tour will be bittersweet for the band and their fans. Mollie and Ted announced in August that they will no longer be performing together after the Southern Tour ends Feb.1 in Holiday, Florida. They have taken on one engagement in Georgia after February, but as of now, that is the only performance they are doing together. 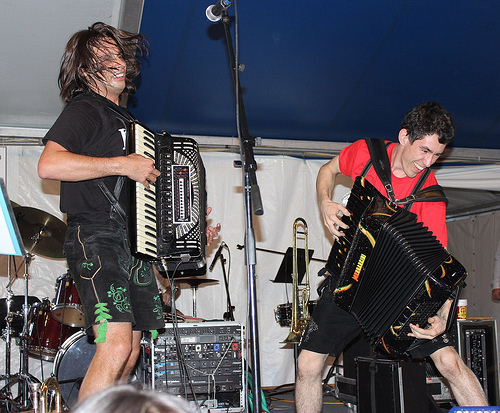 SqueezeBox began in the late 1990s as the Bratwurst Boys, which was a spin-off band consisting of members of the Grammy-nominated Toledo Polkamotion. 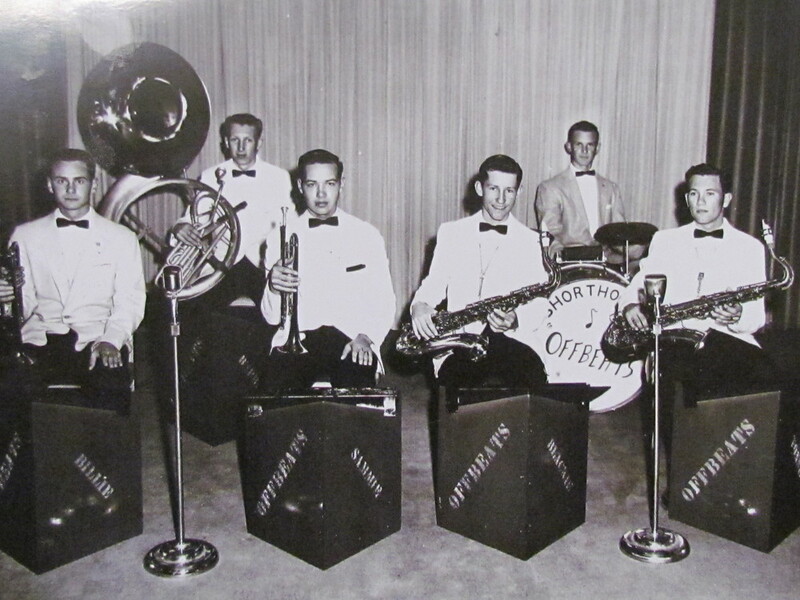 In 2005, band members were Ted Lange on accordion/bass and vocals, Dave Burner on drums and vocals and Ted’s mother, Betty Lange, on second accordion. He says the band’s success was a musician’s dream. “I’m still in awe when I look at what we have achieved. I’ve also been blessed to work with other great musicians who have performed with us through the years, and of course, my wife, Mollie, who is one of the hardest working and most talented people I know,” he adds. At the present moment, it is not clear exactly what will happen to Squeezebox . Mollie intends to keep the Mollie B Polka Party going on RFD-TV and will resume performing again. “I just don’t know with who, when or where, but hopefully I will have performances in Texas again,” Mollie says. No word yet on Polka Party taping locales for the future. Are You Ready for the Wurst? Alex Meixner is. The Grammy-nominated Tasmanian devil of the polka world will once again do the honors of opening Wurstfest on Friday, November 7. The Alex Meixner Band will perform at the fest through November 13 and will feature the usual suspects - Ed Klancnik on drums, Mikey Kramar on horns, strings, accordions and things, and Hank Guzevich on horns, guitar and Polexican shuffles, as well as Canadian National Accordion Champ Michael Bridge for the weekend gigs. Since Alex spends a great deal of his life on the road, it was cool to catch him at home waiting for the cable guy to chat about Wurstfest and other polka stuff. Polkabeat: Anything new for Wurstfest? Polkabeat: Tell us more about Los TexManiacs. Alex: Max Baca is the premier bajo sexto player on the planet. (Bajo sexto is a 12-string guitar-like instrument.) Max is featured on my Polka Freakout CD and he has recorded with Flaco Jimenenz, Los Lobos, Original Texas Tornados and even the Rolling Stones (Voodoo Lounge CD). The group also features Max’s nephew, Josh Baca, on accordion. I’ve known Josh since he was an eight-year-old punk and now he’s 20-something and is one of the best three-row button box accordion player I’ve ever heard. They are just a great family. Polkabeat: You and Max are working on an album together, right? Alex: Yes, actually for the past six years. We hit the recording studio when we can. The music gets back to the roots of conjunto music from when Germans, Austrians and Slovenians settled in Mexico. It honors the music legacy of our grandfathers and fathers, and brings it full circle like the performance we’ll be doing at Wurstfest. Alex: Because I truly believe happiness is a choice and I think it sends a positive message. Polkabeat: Who did you work with on the CD? Polkabeat: Why die thirsty? Isn’t that your mantra? Alex: Yes. Randy wrote that song. He always heard me say at performances, “If you drink, you’re going to die. If you don’t drink, you’re going to die. So, why die thirsty?” He sent it to me just as we hit the studio in San Antonio to record the CD. We quickly came up with an arrangement and now it’s one of the most requested songs on tour. Polkabeat: What is the most requested song? Alex: “Amazing Grace.” It’s performed on a hoseaphone and begins as a solemn performance and ends with screaming trumpets. Polkbeat: The CD also has a family connection, right? Alex: My daughters Zoey (age 7) and Kayla (age 4) are featured on “Pipihenderl,” a fun Austrian yodeling song. And Zoey also did the watercolor for the CD cover, which has led to production of a hat pin and t-shirt. I am very proud. Polkabeat Inc. has purchased the Texas Polka News. The transaction was completed on July 26 and the first issue under the new publisher, Theresa Cernoch Parker, is expected in September. The newspaper was started 26 years ago by musician and polka promoter Julius Tupa of Houston as a way to provide dance enthusiasts with a monthly schedule of events and the latest news of the Texas music scene. When Julius Tupa passed away in 2002, his friend, John Rivard, became the editor of the newspaper with Tupa’s wife, Marie, at the publishing helm. The monthly newspaper has grown to have almost 2,000 readers, not only in Texas, but across the country. Theresa Parker, Gary E. McKee and Marie Tupa toast the sale of the Texas Polka News with Shiner beer and kolaches. Cernoch Parker founded polkabeat.com in 2010 to honor the memory of another polka lover, her father, Willie Cernoch, originally from Dubina, Texas. The website provides monthly listings of dances and festivals, as well as news, photos and videos from events. The site also has a Polka On! store featuring polka apparel, accessories, gifts and CDs/DVDs. More than 1,200 subscribers receive a weekly e-newsletter featuring the weekend lineup of events in Texas. “I know Julius and my dad are looking down on us with a smile. The two of them were good friends who thought polka was the best music genre ever. The Tupas and John have provided a wonderful service to Texas music fans over the years and I am honored to be given the opportunity to continue in their footsteps,” Cernoch Parker said. Click here to subscribe or renew your subscription. For more information on advertising in the Texas Polka News, email theresa@polkabeat.com. Polkabeat.com is proud to partner with Texas Dance Hall Preservation to present a dance to benefit Cat Spring Hall and Texas Dance Hall Preservation. The very popular Ennis Czech Boys kick off the event at 3 p.m. and will play for the dance until 6:30 p.m. and then at 8 p.m. the legendary Western Swing band, The River Road Boys will take the stage until midnight. Texas Folklife is pleased to announce the names of the talented young accordionists who were chosen as the 2014 Big Squeeze Champs. They are Garrett Neubauer, Grand Prize Winner for Polka; Randall Jackson, Grand Prize Winner for Zydeco; and Aaron Salinas, Grand Prize Winner for Conjunto. The winners were chosen at the Big Squeeze Finals and Concert held on the Lone Star Plaza at the Bullock Texas State History Museum last Saturday. Nine finalists and three honorable mentions performed before the large, enthusiastic Texas roots music loving crowd. The program featured Grammy Award-winning Sunny Sauceda, Curtis Poullard and the Creole Zydeco Band, the Austin-based Fabulous Polkasonics, and Michael Ramos, the reigning Big Squeeze Champ. This year was the eighth annual Big Squeeze accordion contest for up-and-coming Texas musicians. In order to better nurture young Texas talent, Texas Folklife has expanded the popular contest. Instead of one Big Squeeze Champ, three Final Grand Prize Winners were chosen to represent the three main accordion genres—polka, zydeco, and conjunto. The polka genre includes German, Czech, and Polish traditions. Zydeco includes Creole and Cajun musical traditions. And conjunto includes norteño and Tejano. There were eight talent showcases scheduled around the state that were free, open to the public, and featured performances by local musicians. Six showcases have already occurred: Houston Creole Festival (February 1); La Joya High School (February 8); McDonald Public Library in Corpus Christi (February 9); Texas Polka Festival and Symposium in Schulenburg (February 22); MECA in Houston (February 23); the Latino Cultural Center in Dallas (March 23); and Los Fresnos High School (March 29), and the Gallista Gallery with Conjunto Heritage Taller in San Antonio (April 4). This year saw a large increase in the number of participants and the number of audience members throughout the state for the contest. There were 49 contestants and over 3,000 individuals who attended the eight talent showcases. There were over 500 in the audience at the Final Playoffs and Concert, with many getting up to joyously dance and root for the young the squeezeboxers. All three winners will perform at Texas Folklife’s highly acclaimed annual Accordion Kings & Queens Festival at Houston’s Miller Outdoor Theatre on Saturday, June 7, 2014. The three young winners will hit the jackpot because this will be a special year to perform at Accordion Kings & Queens as it will be the 25th anniversary! In addition, the three Big Squeeze 2014 Grand Prize Winners received a prize package valued at more than $4,000, including a cash prize, a brand new Hohner accordion, performance opportunities in Austin and Houston, publicity, professional development, and other professional opportunities. Congratulations to the three finalists in the polka category of Texas Folk Life's Big Squeeze Contest - Rebecca Huck of Harker Heights, Chris Trojacek of Ennis and Garrett Neubauer of Altair! They will compete for the grand prize at the Bullock Texas State History Museum on Saturday, April 26. The event will be held from 2:00 to 6:00 p.m. on the Lone Star Plaza in front of the museum (in case of rain it will be held inside), and is free and open to the public. Finalists in the other categories are: zydeco - Randall Jackson of Dallas, Je'an-Trel Jolivette of Marvel and DeJe'an Jolivette of Marvel and conjunto - Aaron Salinas of San Antonio, Luis Gonzales of Grand Prairie and Mariano Resendez of La Joya. The contest this year attracted 49 contestants, the largest number in its history. Seventy-five percent of the contestants were conjunto accordion players. Because of the larger number of conjunto contestants, there were three Honorable Mentions in that category: Rito Peña of San Antonio, Alan Guerra of Mission, and Nizhoni Begay of San Antonio. The Big Squeeze finalists will perform before the judges and the public at the Bullock Museum. While the judges deliberate on the winners, the crowd will be entertained by an all-star musical line-up. This year’s program is headlined by Grammy Award-winning Sunny Sauceda, a Tejano star who likes to collaborate and “mix it up” in other genres, allowing him to stand out, breakout and crossover into one of the top solo artists performing today. Also on this dynamite program are zydeco accordionist Curtis Poullard and the Creole Zydeco Band and the Austin-based Fabulous Polkasonics famous for their “old country polkas.” And Michael Ramos, the 2013 Big Squeeze Champ, will join this exciting group of musicians who will no doubt wow the crowd with all things accordion. This is the eighth annual Big Squeeze accordion contest for up-and-coming Texas musicians, 21 years of age or younger. In order to better nurture young Texas talent, Texas Folklife expanded the popular contest this year. Instead of one Big Squeeze Champ, there will be three Final Grand Prize Winners chosen to represent the three main accordion genres—polka, zydeco, and conjunto. The polka genre includes German, Czech, and Polish traditions. Zydeco includes Creole and Cajun musical traditions. And conjunto includes norteño and Tejano. All three grand prize winners will perform at Texas Folklife’s highly acclaimed annual Accordion Kings & Queens Festival at Houston’s Miller Outdoor Theatre on Saturday, June 7, 2014. The three young winners will hit the jackpot because this will be a special year to perform at Accordion Kings & Queens as it will be the 25th anniversary! In addition, the three Big Squeeze 2014 Grand Prize Winners will receive a prize package valued at more than $4,000, including a cash prize, a brand new Hohner accordion, performance opportunities in Austin and Houston, publicity, professional development, and other professional opportunities. Texas Folklife and the Bullock Texas State History Museum are pleased to announce that the Finals for the annual Big Squeeze accordion contest will take place at the museum on Saturday, April 26. The event will be held from 2:00 to 6:00 p.m. on the Lone Star Plaza in front of the museum (in case of rain it will be held inside), and is free and open to the public. Big Squeeze finalists, whose names will be announced on April 11, will perform before the judges and the public. While the judges deliberate on the winners, the crowd will be entertained by an all-star musical line-up. This year’s program is headlined by Grammy Award-winning Sunny Sauceda, a Tejano star who likes to collaborate and “mix it up” in other genres, allowing him to stand out, breakout, and crossover into one of the top solo artists performing today. Also on this dynamite program are zydeco accordionist Curtis Poullard and the Creole Zydeco Band and the Austin-based Fabulous Polkasonics famous for their “old country polkas.” And Michael Ramos, the 2013 Big Squeeze Champ, will join this exciting group of musicians who will no doubt wow the crowd with all things accordion. There were eight talent showcases scheduled around the state that were free, open to the public, and featured performances by local musicians. Six showcases have already occurred: Houston Creole Festival (February 1); La Joya High School (February 8); McDonald Public Library in Corpus Christi (February 9); Texas Polka Festival and Symposium in Schulenburg (February 22); MECA in Houston (February 23); the Latino Cultural Center in Dallas (March 23); Los Fresnos High School (March 29) and the Gallista Gallery with Conjunto Heritage Taller in San Antonio (April 4). Nine finalists (three from each genre) will be chosen from the field of performers at the showcases by a panel of esteemed music professionals. Accordionists will be judged on their technical proficiency—skill in playing, and technical and musical accuracy—as well as their song interpretation (stylistic choices, innovation, and originality) and stage presence (level of comfort on stage and attention to personal appearance). The nine finalists will be announced on April 11. The finalists will perform at the Finals Concert and Playoffs at the Bullock on April 26. As mentioned, there will be three Grand Prize Winners selected. All three winners will perform at Texas Folklife’s highly acclaimed annual Accordion Kings & Queens Festival at Houston’s Miller Outdoor Theatre on Saturday, June 7, 2014. The three young winners will hit the jackpot because this will be a special year to perform at Accordion Kings & Queens as it will be the 25th anniversary! In addition, the three Big Squeeze 2014 Grand Prize Winners will receive a prize package valued at more than $4,000, including a cash prize, a brand new Hohner accordion, performance opportunities in Austin and Houston, publicity, professional development, and other professional opportunities. The Big Squeeze is supported by the members and Board of Texas Folklife and by Hohner, Inc.; by grants from Texas Commission on the Arts and the Texas Music Office, the City of Austin through the Cultural Arts Division, the City of Houston through the Miller Theatre Advisory Board, the City of Dallas Office of Cultural Affairs, the Houston Endowment, Humanities Texas, H.E.B., Texas Gas Service, and Central Texas Accordion Association. Additional support is provided by regional businesses including SugarHill Recording Studios, Antone’s Records, Hacienda Records, and Frank+Victor Design. This year's Big Squeeze Contest sponsored by Texas Folklife is going to be bigger and better this year. Instead of one grand prize winner, three will be chosen, one in each category - Polka, Zydeco and Conjunto. Yay! The Texas Folklife folks had been trying to figure out a way to encourage more polka and zydeco contestants and I think this is a great solution! Texas Folklife announces its eighth annual Big Squeeze accordion contest for up-and-coming Texas musicians, 21 years of age or younger. The non-profit that endeavors to preserve and promote Texas’s diverse cultural heritage is looking for great players in all genres of the Lone Star State’s accordion-based music, including German, Czech, and Polish polka; Creole, Cajun, and zydeco; and conjunto, norteño, and Tejano. In order to better nurture young Texas talent, Texas Folklife is restructuring the popular contest this year. The contest will go on the road again this spring in order to meet the young accordion players in their communities in “talent showcases.” Three Final Grand Prize Winners will be devoted to the three main accordion genres—polka, zydeco, and conjunto. The polka genre will include German, Czech, and Polish traditions. Zydeco will include Creole and Cajun musical traditions. And conjunto will include norteño and Tejano. The showcases will be free, open to the public, and feature performances by local musicians. Nine finalists (three from each genre) will be chosen from the field of performers at the showcases (and those who send in their performances to Texas Folklife) by a panel of esteemed music professionals. Accordionists will be judged on their technical proficiency—skill in playing, and technical and musical accuracy—as well as their song interpretation (stylistic choices, innovation, and originality) and stage presence (level of comfort on stage and attention to personal appearance). The nine finalists will be announced on April 11. The finalists will perform at the Bullock Texas State History Museum in Austin on Saturday, April 26. Three Grand Prize Winners will be selected. There will be one winner for each accordion category—polka, zydeco, and conjunto. All three winners will perform at Texas Folklife’s highly acclaimed annual Accordion Kings & Queens Festival at Houston’s Miller Outdoor Theatre on Saturday, June 7, 2014. The three young winners will hit the jackpot because this will be a special year to perform at Accordion Kings & Queens as it will be the 25th anniversary! Interested players are encouraged to reserve a showcase slot at a venue in their region by contacting Texas Folklife. Those who cannot attend a showcase may also mail or e-mail their entries to arrive at Texas Folklife no later than April 7, 2014. The complete contest rules and entry forms are available online at www.texasfolklife.org or by calling (512) 441-9255. The three Big Squeeze 2014 Grand Prize Winners will receive a prize package valued at more than $4,000, including a cash prize, a brand new Hohner accordion, performance opportunities in Austin and Houston, publicity, professional development, and other professional opportunities. The Big Squeeze is supported by the members and Board of Texas Folklife and by Hohner, Inc.; by grants from Texas Commission on the Arts and the Texas Music Office, the City of Austin through the Cultural Arts Division, the City of Houston through the Miller Theatre Advisory Board, the City of Dallas Office of Cultural Affairs, the Houston Endowment, Humanities Texas, H.E.B., and Texas Gas Service. Additional support is provided by regional businesses including SugarHill Recording Studios, Antone’s Records, Hacienda Records, Frank+Victor Design, and Embassy Suites Hotel in Austin. Texas Folklife is a statewide non-profit organization dedicated to presenting and preserving the diverse cultures and living heritage of the Lone Star State. Celebrating its 30thanniversary in 2014, Texas Folklife has honored the authentic cultural traditions passed down within communities, explored their importance in contemporary society, and celebrated them by providing accessible and joyful arts experiences. It is located in Austin, Texas, in the SoCo neighborhood—one of the city’s vibrant commercial and arts district. When it's wintertime in Texas, it's time for polka tours! There are some great polka acts from up North and across the pond coming to Texas in January and February ready for warmer climes, smiling polka lovers and good ol' Texas hospitality. Mark your calendar to see these great performances. A group of Houston polka lovers are hosting a benefit on Friday, November, 8 to raise money for their family and friends who were affected by the plant explosion in West, Texas. The Polka for the Park event will be held at SPJST Lodge 88 in the Heights and the evening of fundraising will be full of entertainment, including an auction and dance. Grammy-winning band Brave Combo will be headlining the event. Proceeds will help West residents rebuild their city park honoring First Responders. Table underwriters will be invited to a pre-event reception with the guests of honor West Mayor Tommy Muska and his wife, Lisa. Polkabeat visited with Karen Carr, one of the organizers to find out more about the event. Who all is involved in planning the event? Family and friends of West residents. There are 12 of us that have worked together to plan the event. My mom, Barbara Fisher, was raised in West and the mayor, Tommy Muska, is our cousin. In no time at all we had people eager to pitch in and help. Why did y'all decide to hold the event? Several of us went to West several days after the explosion to help in any way we could. There were tremendous relief efforts in place but we still wanted to do something more. We thought this event would be a nice way to keep the momentum going and to allow those that could not make it to West to show support in Houston. Why did you select the park as the beneficiary? Tommy mentioned that this would be a gift the whole town could benefit from. The park was destroyed in the blast. Then when we learned about Parker’s Park Project, we knew it was the right thing to do. Parker’s father Joey, is one of the fallen first responders. It’s Parker’s wish to rebuild the city park, a project his father was a strong supporter of. He has a great “grass roots” effort, and the support is swelling. Why Brave Combo? Brave Combo has been a part of the Westfest lineup for years. The tent is always packed and the band is legendary. They play polka, salsa, rock, zydeco and bring their own infectious fun to every event that they headline. Tickets are $25 and can be purchased online at http://center4gracefoundation.org/donations.html. Congratulations to Fritz Hodde on 50 years in the polka music biz! Fritz and the band, the Fabulous 6, will celebrate by having, what else, a polka party! The free event is set for Saturday, September 14, from 1 to 7 p.m. at the SPJST 18 in Elgin. To help Fritz commemorate this special anniversary, polkabeat asked polka musicians to send their congrats. Dear Polkabeat: We really want to say a “Big Thank You” for all you did to promote Fritz Hodde and The Fabulous Six's "50th celebration." Also, thank you very much for all the other promotions that you do for the band. Sometimes we forget to say thank you and we want you to know that we are grateful. A big thank you for reaching out to polka musicians to comment on Fritz Hodde and The Fabulous Six's 50th anniversary. I copied some of those e-mails and placed them in a memories book on the band table Saturday night. Hope you don't mind. I saw quite a few people looking at them. 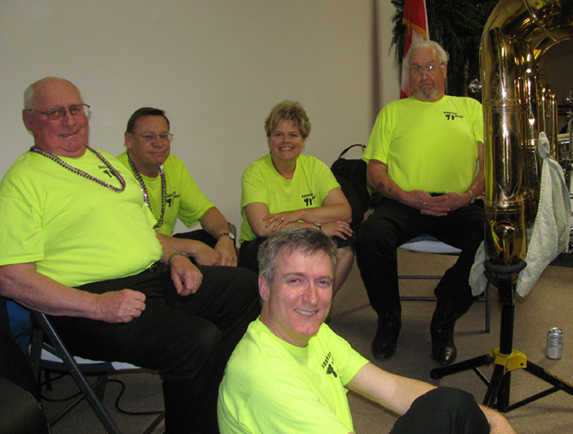 By Theresa Cernoch Parker The Moravians are still abuzz about their summer tour in Wisconsin and Iowa with the SqueezeBox Band and Jim Busta Band. The guys had a great time and it proved to be a love/love experience between the band and polka crowds. Thanks to all polkabeat fans who sent donations to help pay for expenses. Donations came in not only from all over Texas, but also California, Wisconsin, South Dakota, Ohio, Florida, Montana and Minnesota! Polkabeat visited with Moravian Matt Matous about the trip. See more photos. What was your favorite venue? We enjoyed every event that we played at. There wasn't a single place that didn't accept us with wide open arms. As far as our favorite place, one night we played at a restaurant/bar called The Mint in Protivin, Iowa. Earlier in the day we played a street performance outside of the Billy Clock Museum in Spilleville, Iowa. Both of these performances were solo performances by The Moravians, however both Mollie B and Jim Busta sat in with us. These performances were scheduled literally two days before we played there and the turnout was phenomenal. They were small Czech communities and it felt as if we had not left Ennis, Texas. Everyone was friendly and accepted us as if we were from Iowa our entire lives. What were the crowds like? The crowds reminded me of traditional Texas crowds. There were diehard polka lovers, however there was not as much youth at the dances. Everyone was cheerful and they gladly talked to us. Everyone definitely knew their local polka music and it was very neat to bring our experiences and describe our local bands and styles of music. Was the tour what you expected? Name three things you learned. I can’t even begin to describe how much we learned on this trip. Narrowing it down to three specific things is rather difficult. However I believe the most important thing that we learned is that there is a lot more to polka music than just Texas. There are numerous styles and numerous ways to go about doing things. Some things that are acceptable in Texas and are most common, such as wearing jeans and boots to events, are not common in other areas. We learned how to adapt to different environments in order to perform to the best of our abilities. Mollie also taught us how to interact with crowds and people. I can’t think of anyone better than her at being friendly with people. We also improved astronomically musically. We became better musicians throughout the entire trip. We grew closer together as a band and family and owe an enormous amount of thanks to not only Ted and Mollie, but also to Mollie’s entire family and to the entire Jim Busta Band. Their guidance and friendship made our tour greater than we could have ever expected. We didn't quite know what to expect, but we were never disappointed with anything we did nor with anyone we met. Mollie went above and beyond to make sure that we had fun. On an off day she even took us tubing down the Upper Iowa River. This trip was a once in a lifetime experience and we made great friends that we hope to keep for the remainder of our lives. What surprised you the most? The shear amount of generosity that was given to us. People took care of us, and taking care of seven boys is no easy task. We had excellent hospitality, and as I said not a single person that we met was rude or even a bit mean to us. We received nothing but praise, and I know that if I personally ever get the chance to go back I would do so in a heartbeat. Final thought I also want to extend great thanks to you Theresa, and everyone at polkabeat for helping us with this trip. We had an enormous amount of donations that came in from all across the nation. In all honesty if it wasn't for your efforts, we would not have been able to make this trip financially. The guys will keep track of who all contributes by July 1 and polkabeat will send the supporters some Polka On! goodies as a thank you. So how did this come about? “When Ted (Lange) and I were at the National Polka Festival in Ennis, we saw The Moravians perform at Sokol Hall for the live radio show. Ted watched The Moravians as he stood at the edge of the stage, and there I had a short conversation with him about the boys doing a tour with us,” Mollie B said. “I sat down with the guys and discussed ways to make their band better and ways to fulfill their ‘dreams.’ The future of polka music rests in young bands like this. Ted and I are always trying to think of ways to get young bands to form, get a solid beginning and spread the idea of forming bands to other young musicians,” she said. Tour Schedule July 5 The Altrusa Polka Fest at Romy’s Nightingale in Black Creek, Wisconsin. The Moravians will open for SqueezeBox and play during the breaks. July 6 Cresco Polka Fest, Cresco, Iowa. Bands: SqueezeBox, Jim Busta Band & The Moravians. July 7 Polka Fest in Arcadia, Iowa. Bands: SqueezeBox, Jim Busta Band & The Moravians. July 9 Winneshiek County Fair, Decorah, Iowa. The Moravians will join the Jim Busta Band for a few songs. July 10 & 11 Still lining something up. July 12 Performance at Walcott Coliseum in Walcott, Iowa. Bands: SqueezeBox, Jim Busta Band & The Moravians. July 13 Street Performance in Clutier, Iowa (a Czech community). The Moravians will open for SqueezeBox and play during the breaks.